Vancouver, British Columbia--(Newsfile Corp. - January 16, 2019) - Great Bear Resources (TSXV: GBR) (the "Company" or "Great Bear") today reported drill results from the Hinge Zone ("DHZ") and South Limb Zone ("DSL") at its 100% owned Dixie Project in the Red Lake District of Ontario. Results include 1,602.73 g/t gold over 0.70 metres (approximate true width) at 150 metres vertical depth. An image of the gold mineralization in DHZ-014 is shown in Figure 1. 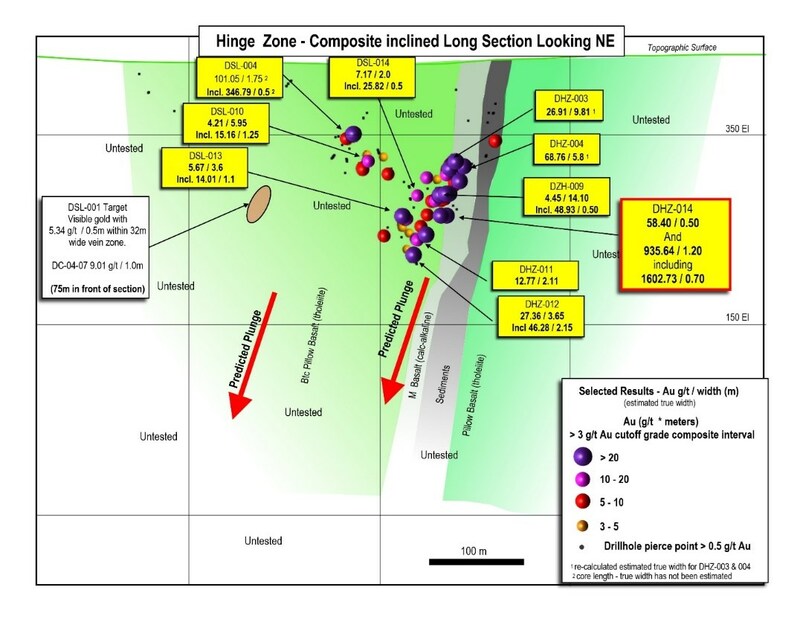 Figure 1: Image of 1,602.73 g/t (51.29 ounces per tonne) gold in Hinge Zone drill hole DHZ-014. The image is selective and is not representative of the gold mineralization hosted on the property. Chris Taylor, President and CEO of Great Bear said: "Our Hinge and South Limb Zone are part of a continuous gold vein system which is interpreted to extend along 300 metres in strike length and has been drill tested to a depth of 212 metres. The zone remains open in all directions and occurs immediately south of a regional east-west trending D2 fold hinge and associated structures which extends for approximately 10 kilometres into undrilled areas. For comparison, the Red Lake-Campbell complex (Red Lake Gold Mine) also occurs proximal to a regional D2 fold where shear zones developed and acted as primary hydrothermal fluid conduits, across a 3.2 kilometre by 2.2 kilometre area. 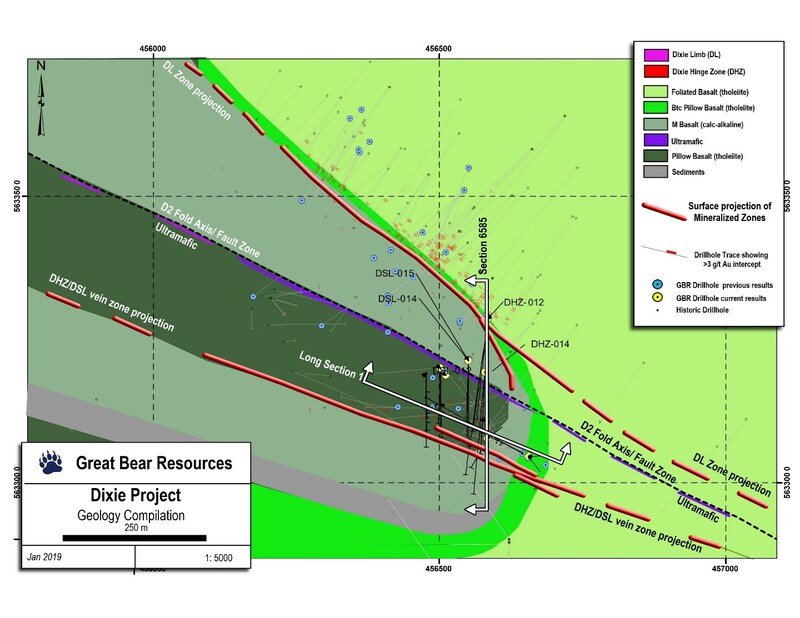 Great Bear's 2019 drill program is fully funded, and results will continue to be released regularly in batches as the program progresses." Hinge zone hole DHZ-014 intersected a 10.1 metre wide vein zone (approximate true width). Visible gold was observed at both its upper and lower contacts (Table 1). The vein zone is part of the larger Hinge/South Limb vein system, which parallels an ultramafic unit and deep-seated fault at the centre of the Dixie gold system (Figure 2). The DSL/DHZ vein system has been intersected in 28 drill holes across 300 metres of strike length to-date and is open along strike and at depth. The D2 fold axis that appears to be a significant gold control has been traced through geophysical methods across more than 10 kilometres of strike length. DHZ-014 was drilled to test Great Bear's 3D vein model, which accurately predicted veining would be present within 15 metres of the actual intercept. Table 1: Detailed assay results including both metric and imperial units from across the complete mineralized zone in Hinge zone drill hole DHZ-014. Interval begins at 150 metres vertical depth. * width is determined to be 95-100% of true width based on intersection points of the drill hole intercept with the geological model and oriented drill core data. Complete assays of zone below in Table 3. Other results include additional gold intervals from previously reported Hinge and South Limb drill holes (see news release of December 12, 2018), identified during assaying of the entire drill holes, and are provided in Table 2. 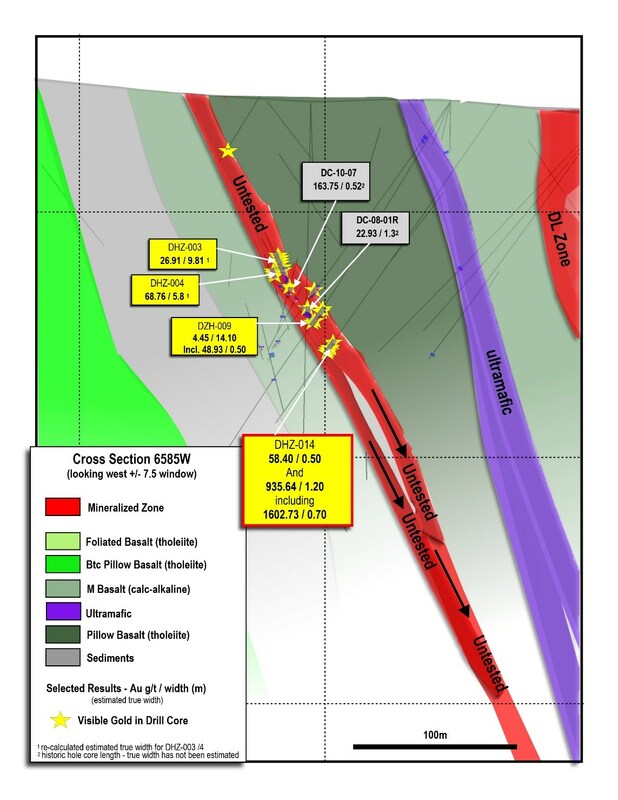 8 of 19 drill holes completed in December 2018 across 220 metres strike length of the South Limb and Hinge zones intersected intervals of greater than 15 g/t gold. Table 2: Additional gold intervals from drill holes previously released by Great Bear from the Hinge and South Limb Zones. Original results were provided on December 12, 2018. * width is determined to be 95-100% of true width based on intersection points of the drill hole intercept with the geological model and oriented drill core data. A cross section through the Hinge Zone is shown on Figure 2. A map showing the Dixie gold zones and current drill results is shown on Figure 3. A long section through the South Limb and Hinge zones is shown on Figure 4. All assays received from the mineralized zone in DHZ-014 and a description of the observed geology are provided in Table 3. Figure 2: Cross section of Hinge Zone showing central ultramafic and adjacent drill results to-date. Dixie Limb Zone is located to the right of this image and also parallels the central ultramafic. Figure 3: Plan map of the Dixie Gold System showing the drill collar locations and hole traces of currently reported gold results. Additional photos of mineralization are provided at the Company's web site at www.greatbearresources.com. Figure 4: Long section through the DHZ/DSL as drilled to-date showing currently reported drill results. Table 3: All assay intervals and geological description of each interval of DHZ-014 in the vein zone. The Dixie property is located approximately 15 minutes' drive along Highway 105 from downtown Red Lake, Ontario. The Red Lake mining district has produced over 30,000,000 ounces of gold and is one of the premier mining districts in Canada, benefitting from major active mining operations including the Red Lake Gold Mine of Goldcorp Inc., plus modern infrastructure and a skilled workforce. The Dixie property covers a drill and geophysically defined 10 kilometre gold mineralized structure similar to that hosting other producing gold mines in the district. In addition, Great Bear is also earning a 100% royalty-free interest in its West Madsen properties which total 3,860 hectares and are contiguous with Pure Gold Mining Inc.'s Madsen property. All of Great Bear's Red Lake projects are accessible year-round through existing roads.